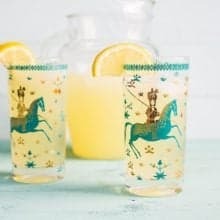 This sparkling bourbon lemonade is one of our favorite drinks and is a great summer cocktail recipe. To prepare, fill a pitcher with lemonade. Add in 1/2 cup of your favorite honey bourbon (we used Wild Turkey American Honey for this video). Now that you have the bourbon and the lemonade in the pitcher, add in 100 ml of Limoncello. Or more to taste. We don't judge. Now add in one can of club soda, pour over ice in your favorite glasses and you are done.